Watson was in critical condition Thursday, May 24, 2012 at a North Carolina hospital after falling at his home in Deep Gap earlier this week. Arthel Lane “Doc” Watson, one of the great modern troubadours of traditional American music, died Tuesday at Wake Forest Baptist Medical Center in Winston-Salem, N.C. He had recently turned 89, and had undergone colon surgery last Thursday. Following another long-standing and more poignant troubadour tradition, Watson was blind, having lost his sight to an eye infection before he was 2. That was one reason he gravitated to the music business, and fellow musicians suggested over the years that was also part of the reason he never saw colors in music. He played black blues, gospel and ragtime as easily as he played “hillbilly” songs and Celtic folk ballads, with the same finger-picking and flat-picking styles and the same rich baritone that often sounded slightly hoarse. He recorded more than 50 albums and won seven Grammy Awards. He also received a Grammy Lifetime Achievement Award in 2004 and the National Medal of the Arts in 1997. 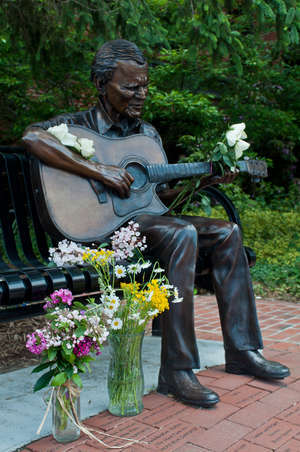 In this photo provided by Mast General Store, flowers adorn a statue of Arthel "Doc" Watson in downtown Boone, N.C., on Friday, May 25, 2012. 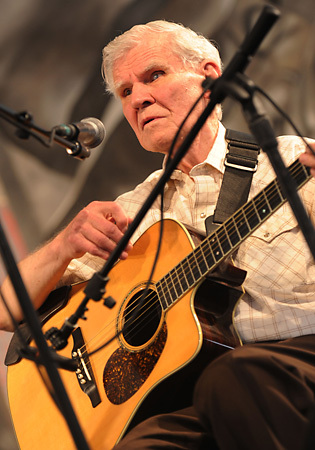 The Grammy-winning folk musician Doc Watson is in critical condition but improving at a North Carolina hospital after colon surgery. His achievements were more remarkable because he didn’t make a serious run at a solo music career when he was almost 40. Before that, he had played in backup bands and done piano tuning, among numerous other jobs. He said in later years that his two goals were to support his family and not to need state assistance for the blind, which he was finally able to relinquish in the 1970s. Watson listened to local musicians and early country artists like Jimmie Rodgers and the Carter Family while memorizing a repertoire of folksongs that would grow to the thousands over the years. Like all good folk musicians, he would add his own twists to traditional songs, many of which were then passed down in Doc Watson versions. He was inspired to start performing in public by the commercial success of folk groups like the Kingston Trio in the late 1950s. Watson headed to the folk festival and club circuit rather than the radio, for which his sound was too traditional. He never lamented this lack of commercial exposure, saying he felt that passing along traditional music was a satisfactory calling. He married his wife Rosa in 1947 and they had two children, Merle in 1949 and Nancy Ellen in 1951. He and Merle played together from the early 1970s until Merle died in a tractor accident in 1985. Doc took three years off before he resumed playing, and in later years was often joined by his grandson Richard.